Artist’s conception of a gravity tractor (Credit: CREDIT: Dan Durda – FIAAA / B612 Foundation). An article on Space.com overview several asteroid deflector techniques, including the lesser known gravity tractor. We already have the technological know-how to prevent dangerous space rocks from barreling into our planet, provided we detect them in time. But this vital job would require a great deal of international cooperation, experts say, and history has shown that working together is not our species’ strong suit. A potentially civilization-ending asteroid will bear down on Earth at some point, panelists stressed. It’s a question of when, not if — and it could happen uncomfortably soon, they said. 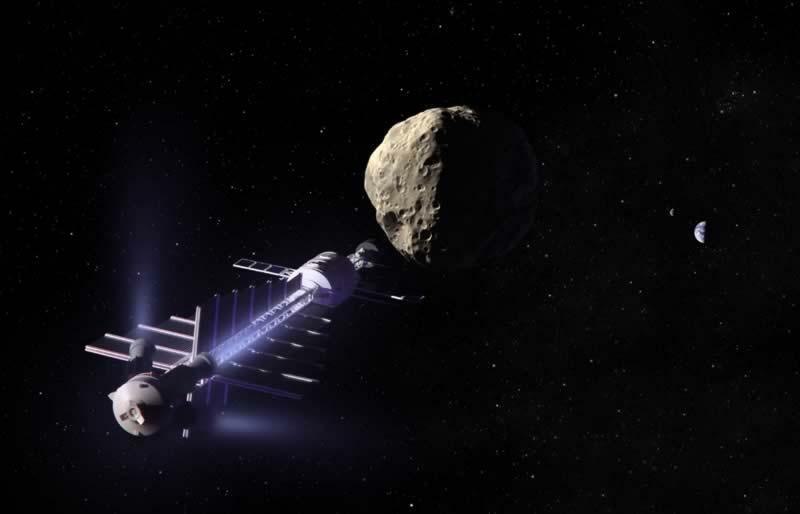 Scientists could sidle an unmanned spacecraft up next to a potentially dangerous asteroid, then let the duo cruise through space together for months or years. Over time, the probe’s modest gravity would tug the asteroid into a different, more benign orbit, Schweickart said. This so-called “gravity tractor” technique would allow for precise deflection, making it perhaps the most attractive option, provided we have enough lead time. Scientists know how to do this, too. Various robotic missions have met up with asteroids over the years, with some even landing on or touching the space rocks. Japan’s Hayabusa spacecraft even plucked some pieces off one in 2005, then sent the samples back to Earth for analysis. You can read the original article on Space.com. Below, artistic reconstruction of an asteroid capture manned mission concept. Infographic: how Hayabusa asteroid mission worked.